Awesome Mobile with great features. Must buy! 5.5 Inchs display with Premium looking 2.5D glass and with high resolution display of 1080 * 1980 pixels. The Lenovo K6 Note 4GB is a phone with nice body design and amazing specifications in a budgeted price. 4 Pricebaba users have written their experience with Lenovo K6 Note 4GB. If you own Lenovo K6 Note 4GB, please do leave your feedback too. Lowest price of Lenovo K6 Note 4GB price in India starts at Rs. 8,490 Lenovo K6 Note 4GB is available on Flipkart at Rs. 8,490 and on Amazon at Rs. 8,499. Prices updated on 25th April 2019. Lenovo K6 Note is a dual SIM device that was launched in September 2016. Complete metallic body, rear-mounted fingerprint scanner, good quality of sound by Dolby Atmos, huge storage, and very good battery capacity are its major highlights. Lenovo K6 Note comes with 5.5-inch Full HD IPS touchscreen display, Gorilla Glass 4 screen protector, and a pixel density of 401PPI. It is available in Dark Gray, Silver and Gold colours. It has a capacitive screen with the multi-touch facility. This K6 Note is powered by a 1.5GHz octa-core Qualcomm Snapdragon 430 processor backed with 4GB of RAM and Adreno 505 graphics. It is a Dual-SIM device and runs Android 6.0 Marshmallow operating system. The phone features sensors such as Accelerometer, E-compass, gyroscope, light sensor and proximity. It also includes FM radio and GPS. For shutterbugs, the Lenovo K6 Note sports a 16MP rear camera with Sony IMX135 CMOS Sensor and 4616 x 3464 pixels image resolution. Up front, it flaunts an 8MP selfie camera. Camera features include geotagging, autofocus, dual tone LED flash, exposure compensation, face detection, HDR, digital zoom, ISO control, and panorama. Users can also record Full HD videos at 1080p. It has an internal storage of 32GB that can be expanded up to 256GB by using a MicroSD card. This dual SIM device comes with a non-removable Li-ion battery of 4000mAh. Users can enjoy connectivity through 4G LTE (India Compatible), 3G, 2G, Wi-Fi, GPRS, EDGE and Bluetooth. 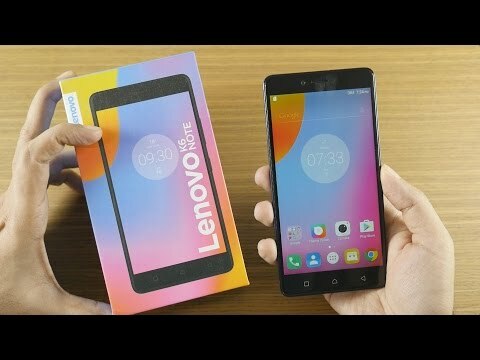 Lenovo K6 Note faces competition from Xiaomi Redmi Note 3 and Samsung Galaxy J7. Xiaomi Redmi Note 3 has a higher battery capacity but lower front camera mega pixels than Lenovo K6 Note. Samsung Galaxy J7 has a lower battery capacity, lower rear and front camera mega pixels from Lenovo K6 Note. Ans: Yes, the Lenovo K6 Note 4GB supports OTG. Ans: No, the Lenovo K6 Note 4GB comes with a non-removable battery. Does it support Reliance Jio Network? Ans: Yes, the Lenovo K6 Note 4GB supports Reliance Jio Network. Will this get further software updates of Android? Ans: It comes with Android 6.0 Marshmallow and has already received the Nougat update. Does the phone have a Hybrid SIM slot? Ans: Yes, it has a Hybrid SIM slot. Does it feature a fingerprint sensor? Ans: Yes, it does feature a rear-mounted fingerprint sensor. What type or charging connector do I need? Ans: You’ll need a micro-USB charging connector for this phone which will come inside the box itself.